There are some things I find necessary for little girls. Things like bicycles, barrettes and summer dresses. But bicycles, barrettes and summer dresses…for dolls? So, when I took my daughter and mother-in-law to the American Girl Doll flagship store in New York City, three full floors of what I can only describe as a doll-museum-meets-Macy’s-on-meds, I thought I’d died and went to doll heaven. Or doll purgatory, given some of the crazy females that surrounded us with spray-on tans, luggage-size European handbags and diamond rings that could give you a black eye if you stood too close. I didn’t know what to think, but I have to say, my daughter was excited. So we were too. We thought we’d simply play our part as good tourists, browse around, shop a bit and take some pictures. But as soon as we stepped off the escalator, we caught a glimpse of the second floor main attraction. 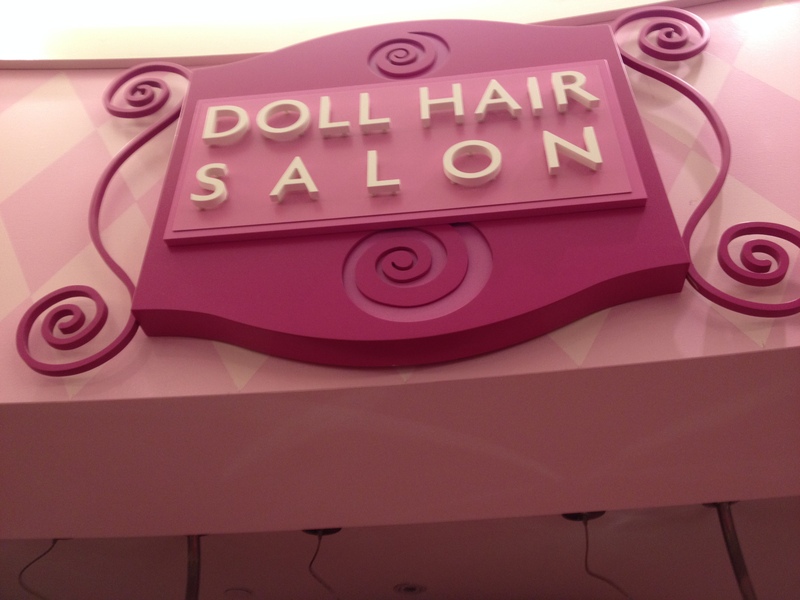 Walking past aisles of fashionable outfits on mini hangers, we saw a pink sign that read, “Doll Hair Salon”. Walking closer, all I could say was “Oh my…GOODNESS” “Oh my GOODNESS”. There was a long row of stylists working at a mock spa, each standing behind mini salon chairs. And a crowd of little women (and their moms) waiting in line. I felt like clicking my heels together because I KNEW we weren’t in reality Kansas anymore. Within minutes, we were sucked into an American Girl Doll-in-Wonderland brain wash.
She wasn’t talking about an appointment for my daughter. Or me. Although, I could have used a blow-out. She was talking about my daughter’s doll. Or my daughter’s doll’s hair to be exact. I never thought I’d live to see the day. My daughter was all smiles, and I was practically choking on my own vomit excitement. If you took one look at her doll, Isabella, from the dirty bare plastic feet on up to its tangly ‘do, you’d know it needed some TLC, Stacey and Clinton style. “Yes.” I said, forcing a straight face, still staring at everything around me in disbelief. “OK,” I said, admiring her combing technique. Months ago, one of my daughter’s friends made a small braid on one part of Isabella’s hair during a play date. I was feeling that icky, guilty feeling you get at the dentist’s office when he cleans your teeth after you’ve devoured half a bag of mini-Reese’s peanut butter cups. But then I reminded myself: This is a doll. You can’t possibly feel guilty for damaging DOLL HAIR. After all, I didn’t braid it, her friend did. I tried to stifle it, but when the stylist started massaging and polishing the doll’s face with a tiny wet spa towel, I couldn’t take it anymore. I started to giggle. Out loud. As I laughed out loud with my mother-in-law and other mothers watching their daughter’s dolls get a full beauty treatment, some cackled along with me, while others were as stone-faced as their five-year-old mini-me’s. Think of a PG version of Real Housewives of New Jersey. With dolls. The RHWONJ-look-alikes were surrounding us. And none of them were laughing. I was beginning to feel like Alice. Almost everyone was under 4 10, including my very sweet Italian mother-in-law. And every display, every piece of furniture was made for a doll. Everything about our visit was surreal. But fun at the same time. The look on my daughter’s face, as if we had entered a magical kingdom filled with unicorns, made it all worth it. My daughter was disappointed that our visit didn’t last forever. Unfortunately, we couldn’t fit in an appointment at the faux café upstairs because we had to run to a Broadway show. It was too bad, because I really could have used a shot cup of pretend tea. As someone who is freaked out by dolls…I’m thanking God right now for my three boys! I have a Landon- a boys boy- Yes- No American Girl stores…but my 8 year old niece- well- spoiled her with a trip- Salon- Cafe- Skating outfit- and 150$ I was broke……..Sad thing is I wanted to buy everything in that place and secretly play with it myself! From a mother of three boys, that sounds very cool! 😉 I can’t believe all of the stuff they have for the dolls now!! How sweet! These are the stories that make me so excited for my girls to grow up (and anxious at the same time!)!! OMG, this cracked me up. 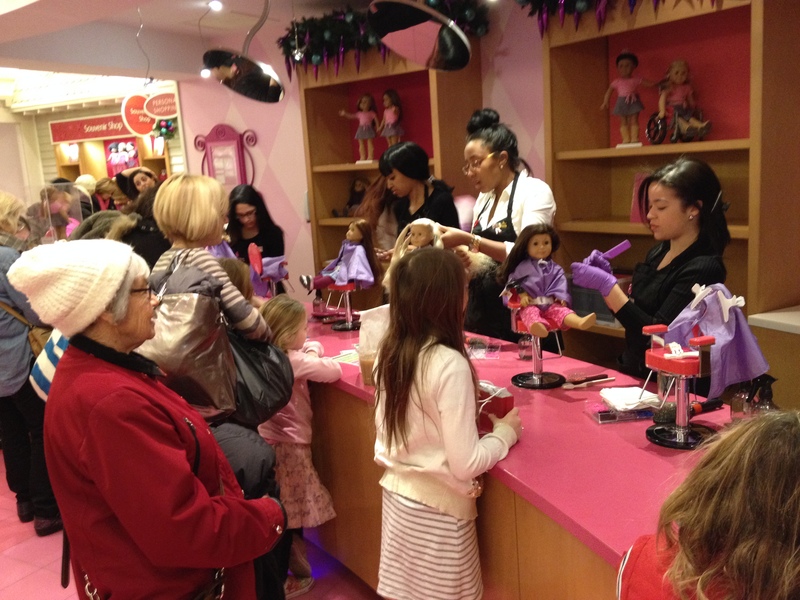 In June are headed to the American Girl Doll store in MA for the very first time. We are going to celebrate my daughters 6th birthday. The plan is to have her pick her doll and then have lunch with cake and ice cream. Apparently, they set a place for the doll too. I think NY is much bigger so I will miss seeing the doll salon. Hope my daughter love it though.